One of the evergreen arguments in the debate over rising income inequality is that what really matters isn’t income, it’s consumption. And consumption inequality hasn’t been rising all that fast. If you measure what people are actually buying, it turns out that the middle class is doing OK.
To the extent that this was true, it was partly thanks to the fact that the middle class was borrowing ever greater amounts in order to support its consumption habits. But that couldn’t last forever. In 2008 all that borrowing came crashing to the ground — taking consumption along with it — and we learned once again that income matters after all. 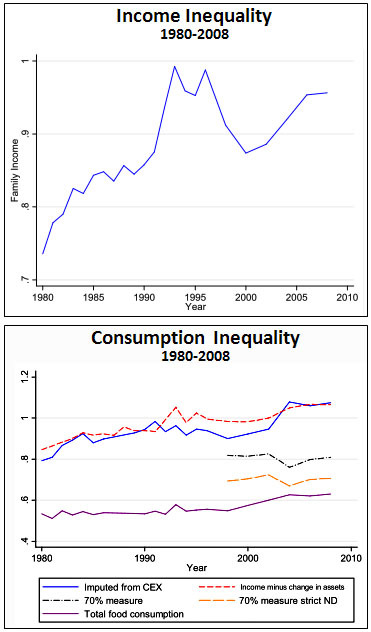 But yesterday Matt Yglesias pointed to a recent paper that adds a whole new dimension to this dispute: the authors (Orazio Attanasio, Erik Hurst, and Luigi Pistaferri) contend that when you correct for well-known problems in the consumption data, consumption inequality has been rising about as fast as income inequality. All the old arguments were just based on faulty data. The charts below tell the story. They rely on survey data from the Panel Study of Income Dynamics, and for each year from 1980 through 2010 they measure the standard deviation of log income and log consumption. (Why use logs? Beats me, but apparently it’s standard practice for this kind of thing.) Standard deviation, of course, is just a measure of dispersion. The bigger the number, the farther apart the highs and lows are from the mean. If this is all true, it means that consumption tracks income pretty well, and both have become steadily more unequal over the past three decades. Surprised?